Target Marketing Systems Wilson Collection introduces a 4 drawer filing cabinet that makes for the perfect addition to your office or home. Designed with great dimensions of 15.8" x 15.8" x 50.8" With Drawer Dimensions 13.5" x 11.75" x 9.6" and Only Weighing 51 lbs., it is easy to store and begin using almost instantly. Crafted from particle board with a melamine finish, it is without a doubt that this is a filing cabinet that has been built to be durable and long lasting for many years to come. The modern design makes it easy to place and compliment your home decor. There is no need to worry about private files or documents because with the lock and key, files can easily be locked away. 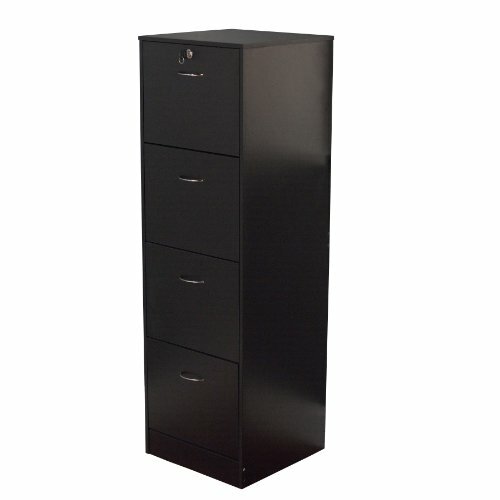 This 4 drawer filing cabinet would make for a great addition to your office but can also be used in your home office or as filing storage anywhere in your home. It is an ideal addition to anyone seeking to organize and declutter their space. Since 1985, Target Marketing Systems has created Furniture that are durable and long lasting. With a commitment to the customer, you can never go wrong with their Furniture because customer satisfaction is the goal. Purchase this furniture with confidence and trust and you will not be disappointed. Give Yourself Additional Space and Style with This Dark Espresso Double Door Floor Cabinet. Featuring Two Glass Doors and Three Interior Shelves. Ideal for Storing Items in Your Home or Office. Guaranteed to Refresh Any Decor.